In light of David Attenborough’s BBC aquatic wonder Blue Planet returning to our screens, we thought it fitting to feature 6 of our favourite cheap diving holidays. With our wallet-friendly prices, you can don your snorkel and flippers without gallivanting all the way to the Galapagos Islands! White sandy beaches, transparent waters and exotic jungles are not all that defines Thailand. The Andaman Sea and the Gulf of Thailand serve up a variety of outstanding scuba diving spots, which cater to different types of swimmers. Hin Daeng and Hin Muang, on the southern Andaman Sea, are excellent for deep water diving, while Koh Tao, situated on the Gulf of Thailand, attracts a large number of aspiring divers looking for cheap certification. Hin Bai or Sail Rock (as it is popularly called) is a premier diving site in the Koh Tao region, noted for regular sightings of giant groupers, long fin batfish and whale sharks! Whether you're an underwater pro or starting as a novice, the diverse destinations of Thailand promise a splash-tastic time without spending big. Croatia's Adriatic Sea coastline has been revered for centuries for its warm Mediterranean climate, clear waters and stunning natural beauty. The sea is dotted with a number of tiny islands which offer outstanding diving opportunities, with Bisevo Grotto in Vis Island, Taranto in Dubrovnik and Bol in Brac Island among the best locations. There are more than 7000 varieties of spectacular marine creatures native to this region, with underwater coral reefs, occasional ship wrecks, hidden coves and even remnants of past civilizations regularly sighted by scuba divers. While you're here, don’t forget to check out the gorgeous beach resorts of Zagreb, Dubrovnik and Opatija, hailed for their fabulous sands and glitzy nightclubs. 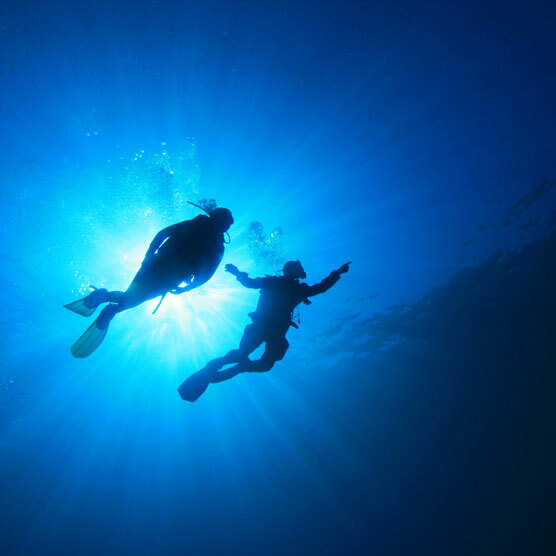 Book one of our Croatia last minute deals and start your underwater journey today. With the second largest reef barrier in the world and 22 kilometers of pristine white sands, Cancun deserves a place on the list of best diving holidays in world. The resort's crystal-clear waters make snorkelling and scuba diving a must while visiting, plus you'll find everything you can imagine and more under the Caribbean Sea's twinkling surface. The Cenotes located in the Mayan Riviera make for a unique experience where you can dive, swim and even hike through spectacular underground caves, while local reef sites in the famous tip of Punta Cancun are unimaginarily beautiful, featuring rainbow-coloured fish and coral. MUSA is undoubtedly the pièce de résistance though, an awe-inspiring underwater museum of art featuring 500 life-size monumental sculptures situated at the bottom of the sea - a sight you have to see, to believe! The land of Pharaohs may not be the first place that springs to mind when you think of diving holidays, but the Red Sea's vibrant corals are a playground for marine lovers. With calm shallow waters, sheltered reefs and a variety of exotic creatures, Egypt holidays are a great choice for diving. In the popular resort of Sharm El-Sheikh you'll find Thistlegorm and Jackson Reef located in the Straits of Tiran, two sites which regularly feature on the wishlists of wreck divers. Browse Sharm El Sheikh last minute deals and you can join exotic schools of fish including tuna, barracuda and jackfish for a swim, sooner than you think. Hurghada is also a popular spot to hop into a wetsuit, with a selection of diving shops dotted around its Sekalla district. The Abu Nuhas Reef in Hurghada has four fantastic shipwrecks to explore, for those seeking history while under the sea. Pleasantly warm water, year-round visibility and a fascinating array of aquatic creatures makes Dominican Republic an ideal destination when it comes to diving. The uninhabited offshore island of Catalina offers both shallow and deep diving, while Silver Bank in the Caribbean Sea is a great site if you want to spot some of the bigger marine beauties - as it happens to be the mating ground for humpback whales. Plus, what better way to dry off than by basking on the gorgeous white sands?